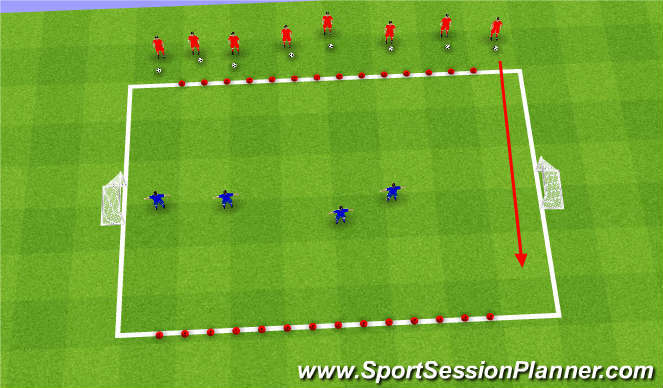 Create two line for the players to start and end at either side of the field. Have players start out without balls. When the coach yells go all the humans (red) have to make it across the field without the Hungry Dinosaurs' (Blue) tagging them. To start off with all the dinosaurs have to do is tag the humans. Play a few rounds so that all players understand the game and then ask all humans to get as soccer ball (as pictured). Now our humans have to get their soccer balls across without the dinosaurs touching the balls with their feet. If a human's soccer ball is touch they become a dinosaur. Have the coach start off as the first dinosaur and the last remaining human become the first dinosaur in the next game.